WPLookup is a useful search service for quickly finding documentation related to WordPress development. 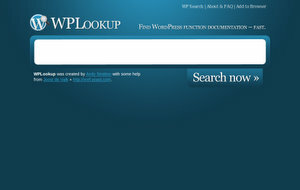 WPLookup is the creation of Andy Stratton. When I first commented I click the new added Notify me feedback, check boxes, and now every comment is that I got the same e-mail comments 4 time. Are you in any waypossible to take the service away from me? Thank you! I don’t think this site is live anymore. When I go there, I am offered a list of sponsored links and a search box. When I type something about WordPress in the search box, I get results about laptop bags and various other products unrelated to the search.